I'm organic. Simple fruits. Super smooth. No big lumps and nothing artificial. Just yummy organic food for babies. No added sugar or salt - I contain naturally occurring sugars. 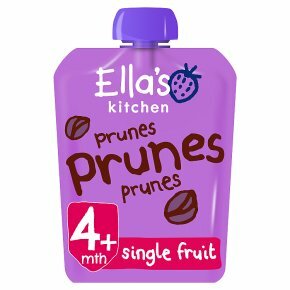 I'm gluten free.Hello, I'm 100% organic pureed prunes - with nothing else added. Who am I made for? My ingredients are suitable from 4 months. I'm also great when mixed into chunkier food for babies who are ready for more texture. The Government advises that you don't need to wean your little one until they are 6 months. Every baby is different! Warning: My cap could be a choking hazard to children under 36 months. Please always keep out of their reach. If I am damaged or look inflamed with air, do not feed me to your baby and return the damaged pouch to us.